I’m obsessed with Anguilla today. Has anyone been? That has nothing to do with today’s cookie, but I am in the process of collecting as much information as possible on the subject. I’ll probably collect information for about a year so there’s plenty of time. For now, here’s a recipe for Oatmeal Walnut Cookies with Maple Glaze. These are very good – not too sweet without the glaze, but on the sweet side of “good” with it. I wanted my cookies to be puffier so I used bleached all purpose flour (as opposed to unbleached) which in my experience seems to make cookies and cakes rise more. If you use unbleached, you’ll get a great cookies but they might be slightly flatter. Update: I now make these with King Arthur unbleached all-purpose flour and they are great. Preheat the oven to 350˚F. Line a couple of cookie sheets with parchment paper. Beat the butter, syrup, and both sugars with an electric mixer. Add the eggs and beat on medium just until combined. Stir in the soda and salt, scraping sides of bowl well, then stir the flour in by hand. Stir in the oats, cranberries and nuts. At this point, you can chill the dough or move directly to baking. Shape dough into balls a little larger than a golf ball. Arrange on parchment lined cookie sheets spacing 2 ½ inches apart and bake on center rack for 10-15 minutes or until cookies appear brown around the edges. Let cool on a wire rack. Whisk or beat together the glaze ingredients and drizzle over cooled cookies. The maple glaze might be the best part of these cookies. I use it on all sorts of things including pound cakes, muffins and scones. These were a hit! I made them for a friend that is due to give birth in 2 weeks. For a cookie – these seemed wholesome with the oatmeal and walnuts – so they fit the bill for my friend. She loved them. Thanks for another great recipe Anna! 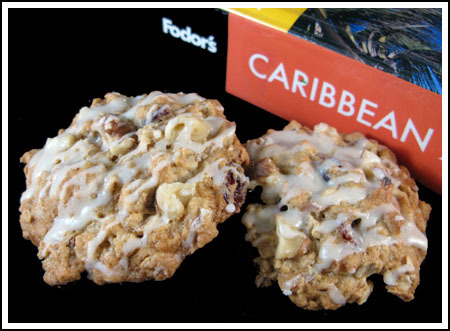 Anguilla is on my list of must visit places and now these cookies are on my growing list of must try cookie recipes. I first learned about anguilla in the Blanchard’s cookbook – At Blanchard’s Table: A Trip to the Beach. It sounds like such a wonderful place. Have you been to the wesite, http://www.anguilla-beaches.com? It’s a wealth of information. However, as a New England girl at heart, your posted version of this cookie with cranberries and maple syrup sounds most appealing to me. These look wonderful! I love oatmeal and walnuts ^.^ I’ll be sure to make these soon! Thanks for the great posts. I honeymooned in Anguilla 6 years ago. It is absolutely beautiful. We stayed at Cap Jaluca which was amazing. Ate fabulous food too..loved Blanchard’s! The island is very secluded and quiet. In fact, we were there for a week and would have liked to have a little more to do. However, there are several islands close by. All in all perfect trip! Ooh–I used to be obsessed with the maple oat nut scone at Starbucks–this looks even better! For maple, I like the ‘homey’ quality of just the walnuts. For a tropical version, however, I can see dried pineapple working…. Janice, thanks for the book link! I will email you with some questions. We got married on the beach (Rendezvous Bay) on Anguilla. I’ve been there probably about 8 times…LOVE IT!!!! I spend a month every year in the Caribbean and Anguilla remains my personal favourite. BTW, when we first went to Anguilla the travel agent swore it didn’t exist and then went on to say it must be one of those “new” Caribbean islands…LOL. These look fantastic- I love using maple syrup in my baking! I will try the extra flour. I thought of dividing the dough after I already added what I had. If you’ve made all the batter but haven’t put the oats in, just divide what you’ve made in half, set half aside until you can get more oats, and add the 1 1/2 cups to the other portion. I think adding spooned and swept (don’t pack the flour) 1 cup of flour would do the trick. Don’t scoop it into the cup, but rather fluff up the flour, spoon it into the cup and level it off. Help, I almost finished making these with Lyle’s syrup in place of the maple syrup and realized I only have 1 1/2 cups oatmeal. I don’t want to drag the kids to the store. Is there any way to salvage these? In the market place in Barbados one of the seands, I forget which one, sells a set of 5 Caribbean flavors. Ooh, they look good. I was hankerin’ for oatmeal cookies today and flipped through one of my books–it’s ALL oatmeal cookies, but didn’t find anything I wanted, so I went with peanut butter. Yum to these. I like the Caribbean twist!